Ephraim’s father has suffered a stroke. In an attempt to help his recovery, his mother, a doctor herself, has taken the family to an old inherited mansion in Maine. Needless to say, it is full of mystery, intrigue and books. In the past, the mansion had been the home of a “water baron.” He bottled and sold water, some said under false pretenses that it was water that could extend your life and health as long as you kept drinking it. Almost like the old tales of the fountain of youth. However, the bottling plant was destroyed in a massive fire decades ago and no one even knows the source of this fantastical water. Ephraim decides this magical water must be found in order to cure his father. While he is a normally a failure at making friends, doing things right, and staying out of trouble his great desire to cure his father helps him overcome a great many fears and weaknesses. He makes friends of children whose parents and grandparents hold grudges against the mansion and all it stands for, but as we come to see, friendship can be a powerful force for good. Interspersed among the chapters are letters and diary entries from 1908, when the water discovery was in full swing. The different flow of language and vocabulary gives readers the feel of the long ago in those sections. A subplot interwoven takes the shape of following the Peary expedition to the pole, in the diary entries, and doing a report on the explorer in the present day. 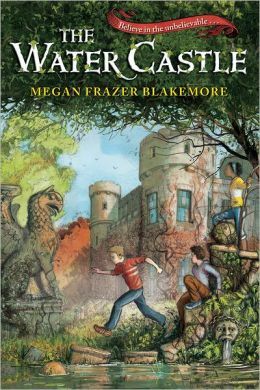 Fifth grade readers will enjoy the adventure of the present day as well as the mystery surrounding the old house. They will wonder if the water can really be making the students in this school so much stronger, smarter and bigger than they would normally be. Every reader and listener will be mourning for father, stuck inside his body and cheering for Ephraim to find a cure. Literacy skills and core curriculum can be enhanced by including some classroom research dealing with the Peary expedition, the radiation of water, the distillation of water, the fountain of youth, and the geography of the town. An art project could be drawing the mansion, the hidden laboratory in the basement or a map of the town. Students could be asked to write what they would use such water for, if they were to discover it. It is a fun read with lots of possibilities, especially that of reading it again! Publisher: Walker Books for Young Readers, an Imprint of Bloomsbury, 2013.